STOP asking Obama to condemn police shootings because he will not. His lips will make words about “it’s not right,” but his heart is with the cop killers and this is evident by his actions. Every time he speaks about cops being killed he promotes the reason they were killed as justified by implying that the black lies that police are racists and murdering black men is true, and he will never admit the lies that black criminals tell. 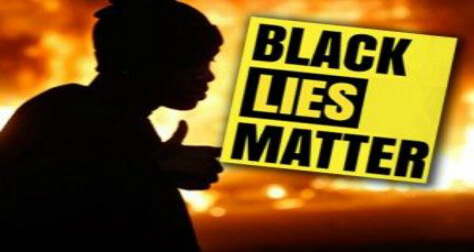 Every police shooting about which BLM makes grievances is based on the lies being told by the black community. Obama knows the truth of every one of these incidents, but he will never speak the truth from the bully pulpit of the president. Instead, he is the exploiter of those lies creating a race war that is exploding in America. The lie – a ten year old black boy is viciously murdered by a big “white Hispanic” for walking through his gated community while eating his candy because he was wearing a hoodie. The truth – a seventeen year old young man saw he was being followed by a community watch member was shot while attacking a smaller neighborhood watchman. The lie – a sweet, gentle giant was daydreaming of going to college when accosted by a white cop for not being on the sidewalk and then shot at, fell to his knees with his hands up in surrender, and then shot in the back execution style. The truth – a huge gangster thug who had just robbed a convenience store was confronted by a cop who he then attacked and beat while sitting in his car, and when he failed to take the officer’s gun and shoot him started to run, then turned back and charged the officer again and was shot dead. The lie – A mentally unstable, unarmed black man was wrestled to the ground and then murdered by police. One of the videos by black witnesses on the scene was the first to hit the Internet from an angle that obscured his hands. The truth – An angry man resisted arrest and attempted to pull a gun from his pocket and was shot, which was proven by subsequent videos from better angles. These are the shootings for which Dallas shooter Micah Johnson turned traitor and terrorist and murdered five white police officers in Dallas. He was corrupted by Islamist posts on social media and, true to Islamic principles of taqiyyah and jihad, murdered people innocent of any crimes because they were somehow associated with those about whom lies were told, but who actually committed no crimes either. The Path to the 2016 RNC ConventionNo More Black Vs. White!